The image on this Flag is familiar to many Americans as one that circulated after the September 11th, 2001 attacks on the United States. The creative overlay of multiple images never fails to inspire in us a powerful sense of pride and resolve! This 3'X5' screen printed poly knit Flag is constructed of materials suitable for display indoors or out. Fly it with pride! This 9/11 Memorial Flag has a sense of dignity that we feel drawn to. An outline of the State of Pennsylvania, an aerial line drawing of the Pentagon and a stylized World Trade Center silhouette complete the 911 imagery. Centered below is the word "REMEMBER" and in smaller letters the words "New York · Washington D.C. · Pennsylvania". Measures 3'X5' and is made of outdoor nylon with header and grommets. This nylon outdoor Flag in the familiar bright rainbow colors will delight all who see your display. Finished with canvas header and brass grommets. Hard-to-find Rainbow Fan in pleated nylon will top off that special event. Equally suitable for indoors or out, measuring 3'X6' and has a canvas header and brass grommets as illustrated. The rattlesnake was the favorite animal emblem of the Americans even before the Revolution. In 1751 Benjamin Franklin's Pennsylvania Gazette carried a bitter article protesting the British practice of sending convicts to America. The author suggested that the colonists return the favor by shipping "a cargo of rattlesnakes, which could be distributed in St. James Park, Spring Garden, and other places of pleasure, and particularly in the noblemen's gardens." Three years later the same paper printed the picture with a commentary on the Albany Congress. To remind the delegates of the danger of disunity, the serpent was shown cut to pieces. 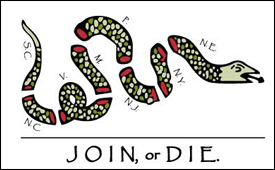 Each segment is marked with the name of a colony, and the motto "Join or Die" below. Other newspapers took up the snake theme. Other authors felt the rattlesnake was a good example of America's virtues. They argued that it is unique to America; individually its rattles produce no sound, but united they can be heard by all; and while it does not attack unless provoked, it is deadly to step upon one. This Flag was featured in the opening credits in 2008 on HBO's mini series, "John Adams".P> Our Flag measures 3'X5' and is constructed of outdoor grade nylon.